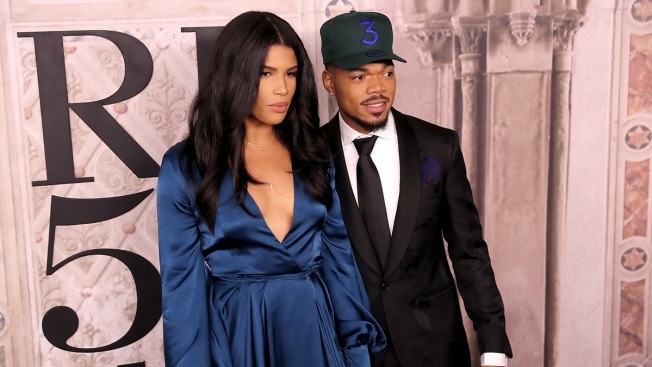 This September 7, 2018, file photo shows Kirsten Corley and Chance the Rapper in New York City. Chance the Rapper just got married. The 25-year-old Grammy winner tied the knot with his childhood crush, Kirsten Corley, on Saturday, at the Pelican Hill resort in Newport Beach, California. The two exchanged vows in front of family and friends in a ceremony held under a huge rotunda overlooking the ocean. Guests included Kim Kardashian and husband Kanye West, and mutual friend and comedian Dave Chappelle. The wedding comes less than a year since Chance got down on one knee on the Fourth of July and popped the big question. "Kirsten Katrina Corley, will you make me a man and be my wife?" he asked his girlfriend and the mother of their 3-year-old daughter, Kensli Bennett, who they welcomed in 2015. The pair split for a period of time following Kensli's birth. The rapper recently recalled the first time he saw Corley while simultaneously tipping off the public that his wedding would be this weekend. In a note posted to social media, the music star described how he attended his mother's office party with the rest of his family when he was 9 years old. There, a trio of young girls around his age performed the Destiny's Child song, "Independent Women." "Now I'm locking eyes with the prettiest girl I ever seen in my almost-a-decade of life on earth," he described. "I really shouldn't even say locked eyes cause really, I was just staring at her; as she and her girls were conquering this choreography and mastering the art of lip-synching in a way even the most professional performers have yet to accomplish." While his father had nudged him to dance with them, Chance, né Chancelor Jonathan Bennett, decided it "wasn't the time or place." "I knew I was gonna marry that girl. And I ain't wanna jump the gun," he wrote. "16 years later it's happening. This [weekend] is the time, and the place is my wedding. I'm gonna dance with my wife because this is my destiny."